2014 was a killer year for the Berlin startup scene. According to the New York Times (who also sourced their data from CB Insights) Berlin tech startups raised a combined $1.1 billion in 2014, a 140% increase compared with 2013. Berlin also saw 24 acquisitions and two of the largest European IPO’s, Zalando and Rocket Internet. If you have been following us this year, you know that we have published analyses for Q1 / Q2, and Q3. During our research we relied heavily on CB Insights, Crunchbase, and local news sources including Venture Village and Gruenderszene. 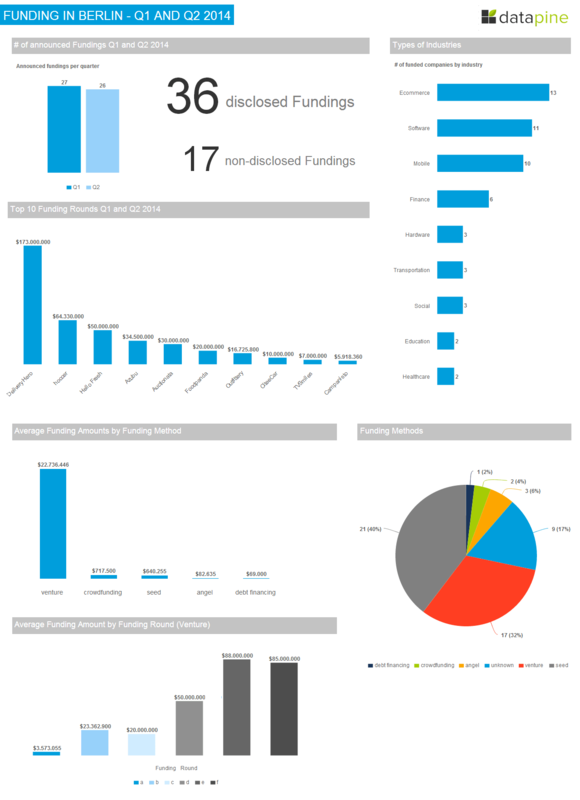 While preparing our 2014 Berlin Startup Funding Analysis, we found a few startups that raised money that were not previously included, and several Q3 deals were announced after publication. If you compare the below data with our previous reports, you will see a small discrepancy in the numbers since the new information is included in the following charts. If you notice any items that we have overlooked, please email to kalie@datapine.com and we will be happy to look into it. Software and Ecommerce were neck-and-neck when it came to funding. 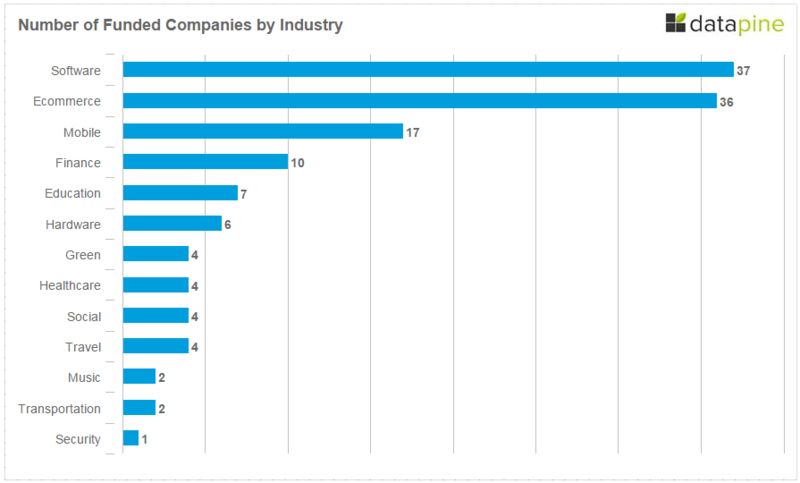 It is worth noting that, while both industries were funded almost equally at 37 and 36 respectively, six of the top ten highest funded companies in 2014 were Ecommerce related, while two were Software related. If you are looking for somewhere to invest, the Ecommerce trend is expected to continue. According to the Verband der deutschen Internetwirtschaft (Association of the German Internet Industry), 53% of German GDP generated in 2017 will be e-commerce related, compared to 37% in 2012. Mobile and Finance startups were a distant third (17) and fourth (10). Global investment in Fintech tripled from 2008 ($928 million) to 2013 ($2.97 billion) It is predicted that investment will increase to an estimated $6-8 billion by 2018. While London has been dubbed the Fintech capital, Fintech funding is also heating up in Berlin, with startups including SavingGlobal, Number26, and Avuba. We expect to see this trend continue; last month it was announced that HitFox plans to start four to six FinTech companies per year, each receiving between €500,000 to €5 million seed investment as part of their “FinLeap” project. Education startups rounded out the top five most funded industry type in Berlin, which fits with global trends. 2014’s global Ed Tech funding and deal activity was on pace to top 2013’s previous investment record. Delivery Hero raised a whopping $523M in 2014, broken down into three rounds. They raised $88M in Q1, followed by $85M in Q2 and a $350M Series G round In Q3. They have officially become a Berlin unicorn; after acquiring competitor Pizza.de in Q3, Delivery Hero’s total valuation exceeds $1 billion. Rocket Internet’s FoodPanda raised two rounds in 2014 for a total of $80M. In Q1, they raised a $20M Series B round and followed that with an additional $60M Series C round in Q3. SoundCloud kicked off Q1 with an announcement that they raised a Series D round of $60M and are now valued at $700M. SoundCloud continued to have an interesting year with whispers of being acquired by Twitter, and rounded out 2014 with the announcement of a music subscription service and a partnership with Warner Music. HelloFresh, a grocery-delivery service that resembles Blue Apron, secured $50M in Series D funding led by Insight Venture Partners with participation from existing investor Phenomen VC. Azubu, a global broadcast network delivering premium live and on-demand eSports programming, secured an unattributed round of $34.5M in funding from the Sapinda Group. 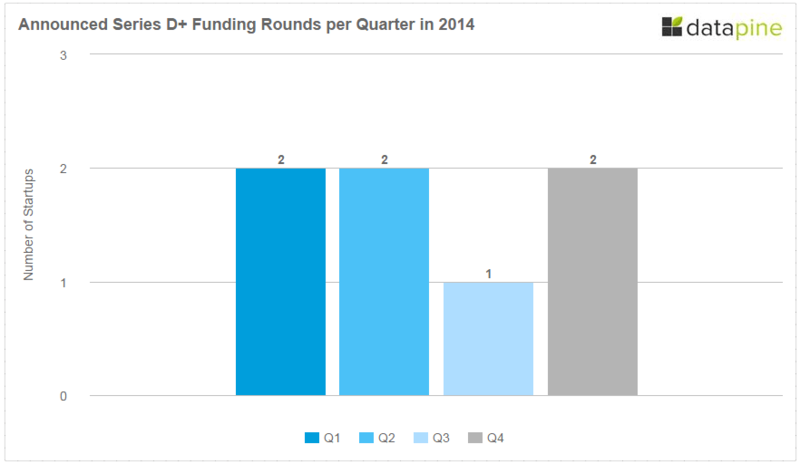 Quandoo, the Open Table competitor, raised three rounds in 2014 for a total of $33M (without their Series D being disclosed). They kicked off Q1 with an Series B $8M round led by DN Capital and Holtzbrinck Ventures. In Q3, they announced a round of $25M in Series C financing led by Piton Capital (Holtzbrinck Ventures, DN Capital, the Sixt family and Texas Atlantic Capital also participated). A Series D round was announced in Q4, but a dollar amount was not disclosed. Backers including Holtzbrinck Ventures, e.ventures and Earlybird invested $29.7M in a series B financing round for online art auction house Auctionata. GoEuro raised $27M in Series A funding led by New Enterprise Associates. Home24, a Rocket Internet online furniture store that competes with IKea, received an unattributed round of financing in the amount of $19.5M. 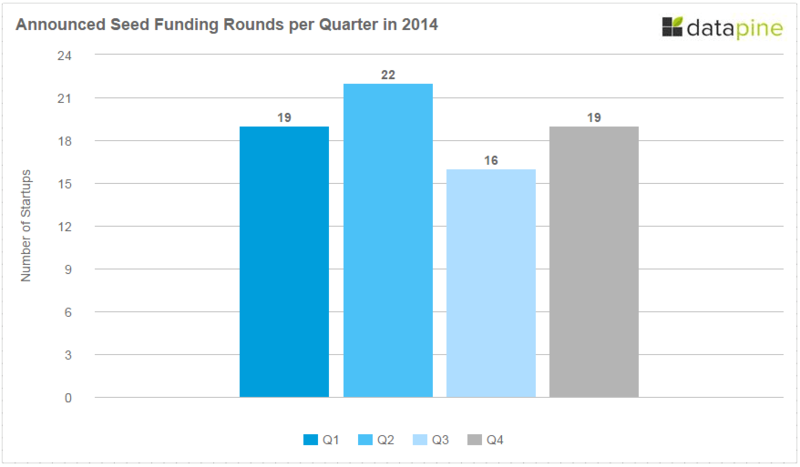 In 2014, 76 Berlin based companies reported that they raised seed rounds. The sample size was thirty-five (the amount that announced funding.) 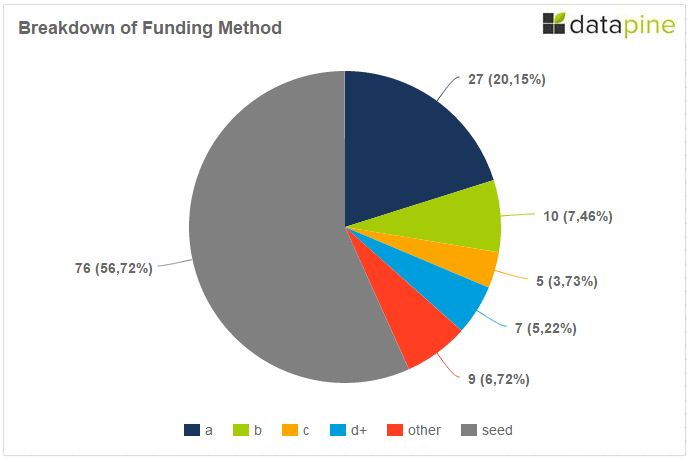 The median seed round for Berlin startups in 2014 was $680,000 and the mean was $971,180. 27 Companies raised Series A rounds. Of the 27 rounds, eleven were undisclosed. When we compare the remaining 16 companies that did disclose numbers, the median Series A for 2014 was $6,300,000 and the mean was $7,900,770. The highest amounts raised were $17M by Helpling and $27 million by GoEuro, which biased the average. The breakdown of industry types included nine for Ecommerce; eight for Software; two each for Travel, Finance and Education; and one startup in the categories of Mobile, Transportation, Healthcare, and Security. 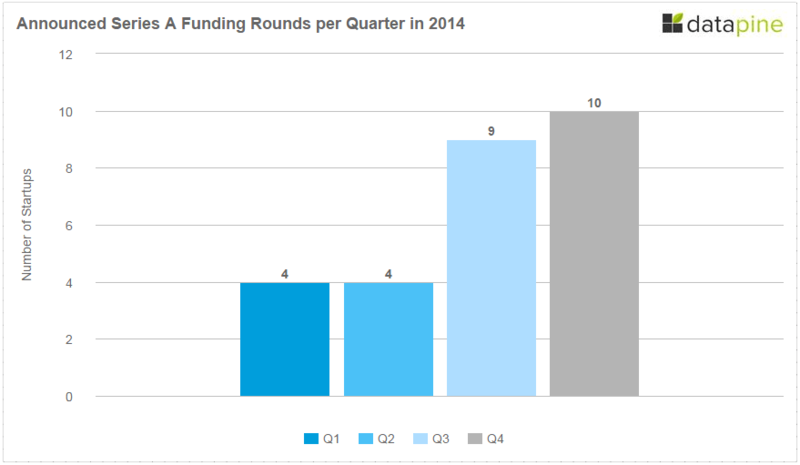 Ten companies raised series B rounds in 2014. Out of the ten companies, seven rounds were disclosed. The median Series B for 2014 was $11,000,000 and the mean was $13,815,114. 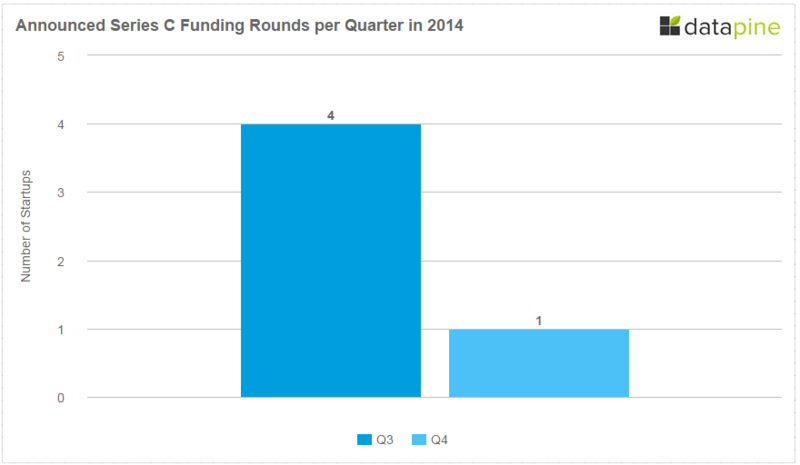 Five companies raised a Series C round in 2014 and all disclosed their amounts. The ranges varied wildly from $4.6M to 60M. The industries represented included Ecommerce, Software (2), Healthcare, and Edtech. All Series C fundraising took place in the second half of the year. The median Series C for 2014 was $7,820,000 and the mean was $21,004,000. Three deals were under $10M, making the median amount much smaller. Delivery Hero raised $88M in Series E, followed by $85M in Series F and a $350M Series G round In Q3. SoundCloud raised a Series D round of $60M. HelloFresh secured $50M in Series D.
Quandoo raised an undisclosed Series D round. 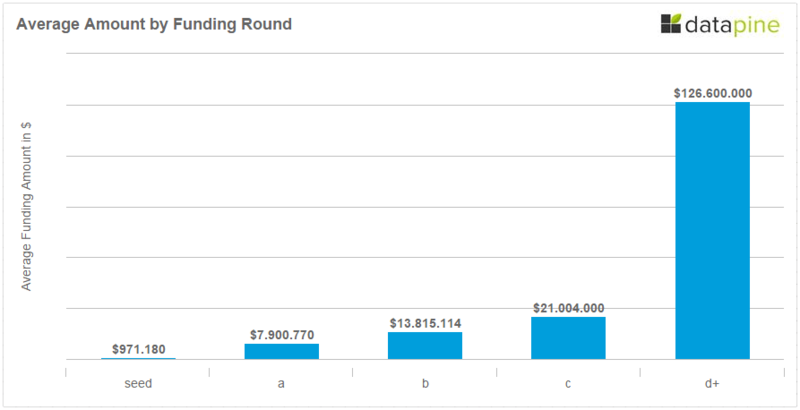 SearchMetrics raised an undisclosed Series D round. Twenty-four Berlin based startups were acquired in 2014. Salonmeister was acquired in October by its UK equivalent Wahanda. The financial terms of the deal were not disclosed. The mobile ad network Moboqo was acquired by Palo Alto-headquartered AppLovin for an undisclosed sum. Xyo sold its app search engine and contextual advertising tech to the U.S. based Mandalay Digital Group, the proprietor of one of Xyo’s biggest rivals, Digital Turbine. While the amount was not disclosed, Gigaom estimates the total amount near $20 million. Fyber, the advertising technology company (formerly SponsorPay), was acquired by RNTS Media for $190 million in a bid to create a global mobile advertising technology company. VentureBeat reports that the acquisition was unusual in that Fyber is the bigger company and its management team will help run the combined company. Deluxe Entertainment Services Group Inc. acquired German B2B cloud service provider Mediapeers for an undisclosed amount. HomestayBooking was acuqired by Dublin-based Homestay.com after they secured $3M in funding. Testhub announced in May its acquisition by Applause (formerly known as uTest) – one of the leading players in the global crowdtesting market. The price and further details of this acquisition has were not disclosed. In April, Software AG acquired metaquark, whose solution enables management of mobile users, devices, and security profiles in a single location to simplify the process of distributing new apps and updates. In my favorite acquisition tale of 2014, bootstrapped company Sociomantic Labs, an ad tech firm that specialises on programmatic and retargeting advertising with an emphasis on e-commerce, was acquired by dunnhumby ltd. Business Insider reported the price to be between $175 – 200 Million. Berlin based HitFox Group acquired mobile targeting platform Datamonk, which enables advertisers to reach specific audiences at scale, for an undisclosed price in April. Dropbox acqui-hired Readmill, the social and shareable reading platform in March. TechCrunch reported the acquisition price at around $8 million. Hoccer, a messenger app, had a majority stake acquired by Media Ventures for $82.6M in March. ProSiebenSat.1 Games acquired online and mobile games publisher Aeria Games Europe for an undisclosed sum in February. German real estate IT goliath Immowelt acquired Dreamflat for an undisclosed amount in February. Skobbler, which produces map-based products for iOS and Androids, sold to Telenav in a deal worth just shy of $24 million. JustBook was acquired by British luxury hotel platform Secret Escape in January for an undisclosed amount. Berlin-based Linko (now inbot) acquired Localstream, a technology platform that adds location context to web and mobile content, in January. Digital advertising company Plista, acquired by GroupMe for $41.5M in January. Berlin Valley News reported that Berlin based companies SmartLaw and Net-Clipping were acquired for undisclosed sums. Perhaps the most talked about events in the Berlin startup scene were the IPOs of Rocket Internet and Zalando. Rocket Internet went public on October 2, 2014, with a posted a valuation of $8.4 billion (6.7 billion euros). It was Germany’s biggest IPO in seven years at €42.5 per share. The stock dropped almost 30% in the first weeks, but recovered in the last months, and as of this writing, Rocket Internet’s stock price is at 46.36 euros. So much for all the schadenfreude in the media. Shares of Zalando, which went public a few days before Rocket Internet, were issued at €21.50. Mirroring Rocket Internet’s trajectory, Zalando stock fell below its debut price but has sinced recovered. Zalando stock is currently priced at €23.69. 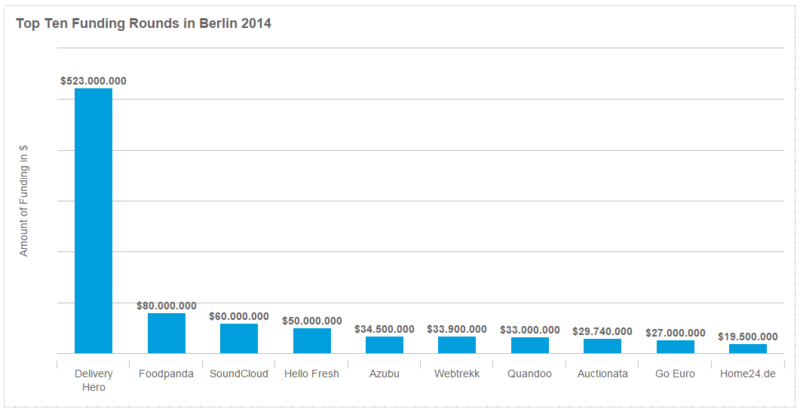 Overall, 2014 was a phenomenal year for the Berlin startup scene. Not only was there a 140% increase compared with 2013, but we finally secured the exits everyone keeps whining about. Sure, Sociomantic didn’t reach the elusive unicorn club, but they still secured a $200M exit without raising a dime from venture capitalists. We saw two of the biggest IPOs in Germany in the last seven years and, after an underwhelming start, they came back with solid year-end numbers. Interested in our KPI dashboards? Sign up for datapine’s fourteen day free trial. 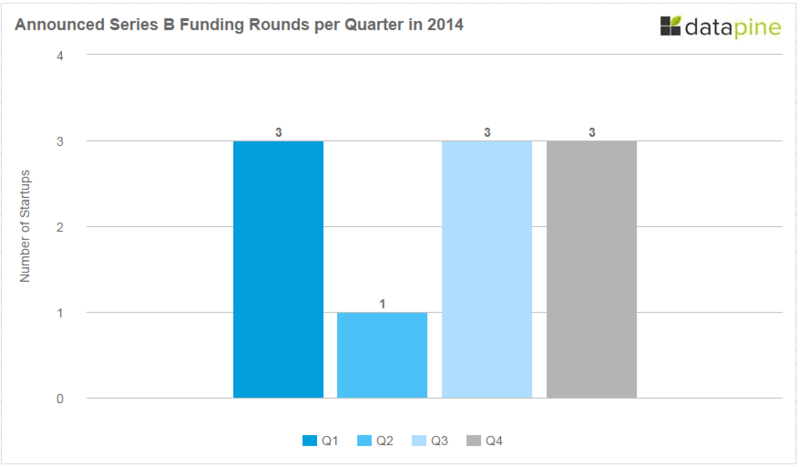 Stay tuned for our Berlin Q1 Funding Roundup for 2015. Again, if we missed something, please let us know at kalie@datapine.com.